Molly Maid Logo Reveal Giveaway Sweepstakes – Win an iRobot Roomba 960 Robot Vacuum! Win an iRobot Rooba 960 Robot Vacuum (5 winners)! 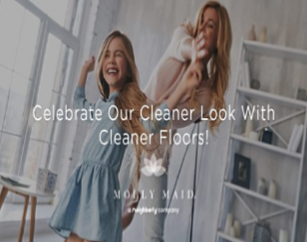 ENTER SWEEPSTAKES HERE – Molly Maid Facebook page. ENTRY LIMIT – Only one Entry per person, per household, per email address will be allowed, regardless of the method of entry. ELIGIBILITY – The Sweepstakes is open only to legal residents of the Continental United States (U.S) and be at least eighteen (18) years or older, or the age of majority in their jurisdiction of residence, whichever is greater, on the date of entry. SWEEPSTAKES ENTRY PERIOD – “LOGO UNVEIL GIVEAWAY” starts AUGUST 29, 2018 at 12:00AM CST and ends SEPTEMBER 12, 2018 at 11:59PM CST. WINNER’S LIST – To obtain the winners’ names, send a self-addressed, stamped envelope to the Sponsor at: Molly Maid 1010 N. University Parks Dr., Waco, Texas 76707, Attn: Molly Maid Logo Unveil Giveaway. 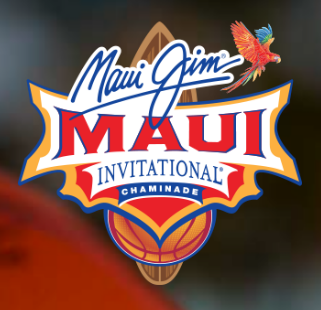 Maui Jim® Maui Invitational Tournament Sweepstakes – Win a trip to Maui! Win a trip to Maui! ENTER SWEEPSTAKES HERE – Maui Jim Sweepstakes page. ENTRY LIMIT – There is a limit of one (1) Entry per person, per email address, for the entire duration of the Promotion. ELIGIBILITY – The Promotion is open to legal residents of the fifty (50) United States and the District of Columbia (excluding Puerto Rico and all other U.S. territories and possessions and overseas military installations) who are eighteen (18) years of age and/or have reached the age of majority in their state of residence at time of entry. SWEEPSTAKES ENTRY PERIOD – The Promotion begins August 1, 2018 at 12:00:01 AM Central Time (“CT”) and ends at 11:59:59 PM CT on August 31, 2018. PRIZES – Grand Prize – On or about September 2, 2018, one (1) winner will be randomly selected to receive one (1) trip for two (2) people (winner and one (1) guest) to the Maui Jim Maui Invitational Tournament, November 19-21, 2018 in Maui, HI (“Grand Prize Trip”). Approximate Retail Value of the Grand Prize is $10,000. The Grand Prize Trip consists of round-trip coach airfare for two (2) people from the major metropolitan airport closest to the winner’s home (as determined by the Sponsor) to Kahului, Maui Island, HI, six (6) consecutive nights standard hotel accommodation (based on double the use of a mid-size rental car for the duration of the stay, one (1) $500 VISA® gift card, two (2) pair of Maui Jim sunglasses of winner’s choice and one (1) pair of tickets for each day of the Maui Invitational Tournament championship games. Travel must be taken between November 17 – November 23, 2018 and must be reserved fourteen (14) days in advance or prize will be forfeited and Sponsor will have no further obligation to such winner. If the potential Grand Prize Trip winner cannot take the Grand Prize Trip on these dates for any reason, the prize is forfeited and will be awarded to an alternate. The Grand Prize Trip is not transferable and there is no cash substitution available. 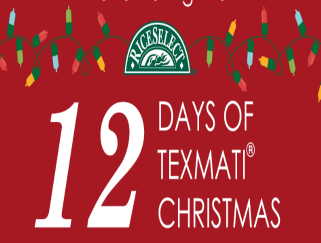 RiceSelect® “The 12 Days of Texmati® Christmas” Sweepstakes – Win a rice cooker & more! Win a rice cooker, RiceSelect coupon & RiceSelect apron (78 winners)! ENTER SWEEPSTAKES HERE – Texmati Sweepstakes page. ELIGIBILITY – Entrants must be legal residents physically residing in the 50 United States or District of Columbia (“U.S.”) who are 18 years of age or older at the time of entry and with a valid social security number or TIN. SWEEPSTAKES ENTRY PERIOD – Entries accepted from 12:00 am Central Time (“CT”) on December 5, 2016 through 11:59 pm CT on December 16, 2016. PRIZES – One (1) drawing will be held on December 6, 2016 and one (1) winner will be chosen. One (1) drawing will be held on December 7, 2016 and two (2) winners will be chosen. One (1) drawing will be held on December 8, 2016 and three (3) winners will be chosen. One (1) drawing will be held on December 9, 2016 and four (4) winners will be chosen. One (1) drawing will be held on December 10, 2016 and five (5) winners will be chosen. One (1) drawing will be held on December 11, 2016 and six (6) winners will be chosen. One (1) drawing will be held on December 12, 2016 and seven (7) winners will be chosen. One (1) drawing will be held on December 13, 2016 and eight (8) winners will be chosen. One (1) drawing will be held on December 14, 2016 and nine (9) winners will be chosen. One (1) drawing will be held on December 15, 2016 and ten (10) winners will be chosen. One (1) drawing will be held on December 16, 2016 and eleven (11) winners will be chosen. One (1) drawing will be held on December 17, 2016 and twelve (12) winners will be chosen. A total of seventy-eight (78) winners will be drawn. Each winner will receive the following prizes: One (1) rice cooker (approximate retail value $19.99); one (1) coupon for two dollars off any RiceSelect® product (approximate retail value $2.00) and one (1) RiceSelect apron (approximate value $5). Total approximate retail value (“ARV”) of prize is $27. 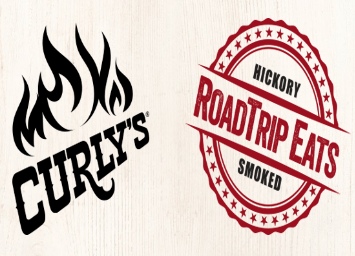 Curly’s Road Trip Eats Amazing Flavor Adventure Sweepstakes – Win $10,000! ENTRY LIMIT – Limit of two (2) entries per person, per email address during the Sweepstakes Period regardless of method of entry. ELIGIBILITY – Curly’s Road Trip Eats Amazing Flavor Adventure Sweepstakes is open only to legal residents of the contiguous United States who are eighteen (18) years of age or older at time of entry. SWEEPSTAKES ENTRY PERIOD – The Sweepstakes begins on August 29, 2016 at 12:00:01 a.m. Eastern Time (“ET”) and ends on September 30, 2016 at 11:59 p.m. ET. PRIZES – One (1) Grand Prize will be awarded. Grand Prize winner will receive a lump sum payment of Ten Thousand U.S. Dollars (US$10,000). 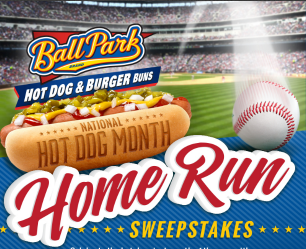 Ball Park® Buns National Hot Dog Month Home Run Sweepstakes – Win a $3,000 Visa gift card & more! Win 2 tickets to a 2016 regular season baseball game (see list of teams below) & a $3,000 Visa gift card! ENTRY LIMIT – Limit one (1) Entry per person per Facebook account/e-mail address for the duration of the Sweepstakes Period. ELIGIBILITY – Sweepstakes is open to legal residents of the fifty (50) United States and the District of Columbia, eighteen (18) years of age or older (except in the case of legal residents of certain states/territories/provinces where the legal age of majority is greater than eighteen (18) years of age, such legal age of majority) as of date of entry with a valid Facebook account as of June 30, 2016. SWEEPSTAKES ENTRY PERIOD – The Ball Park® Buns National Hot Dog Month Home Run Sweepstakes starts on July 1, 2016 at 12:00 a.m. Eastern Time (“ET”) and ends on July 31, 2016, at 11:59 p.m. ET. PRIZES – GRAND PRIZE (1): One (1) winner will receive two (2) tickets for winner and one (1) guest for one (1) Arizona Diamondbacks, Colorado Rockies, Detroit Tigers, Kansas City Royals, Milwaukee Brewers, Minnesota Twins or St. Louis Cardinals 2016 regular season home game, subject to availability and blackout dates; and one (1) $3,000 Visa gift card that may be used to assist with transportation and accommodation costs to attend the selected game (the “Grand Prize”). The Approximate Retail Value (“ARV”) of the Grand Prize: $3,000. Any/all transportation and accommodations associated with attending the selected game will not be provided and will be winner’s sole responsibility. FIRST PRIZES (5): Ball Park® Buns for a year, awarded in the form of 52 coupons, each redeemable for a package of Ball Park® Buns up to $4.00 in value, and one (1) Best Buns in America t-shirt (each, a “First Prize”). The ARV of each First Prize: $223.00. Exact size of t-shirt to be determined by Sponsor, in its sole discretion. The total value of a coupon must be redeemed at one (1) transaction. 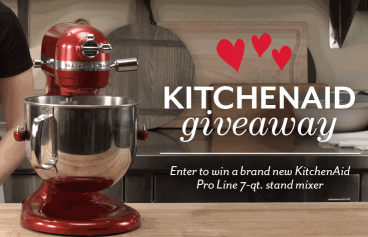 King Arthur Flour KitchenAid Giveaway Sweepstakes – Win a KitchenAid Pro Line Mixer! Win a red KitchenAid Pro Line Stand Mixer! ENTER SWEEPSTAKES HERE – King Arthur Flour Sweepstakes page. ELIGIBILITY – Sweepstakes is open to all individuals, 18 years of age or older as of the date of entry, who are legal residents of the United States. 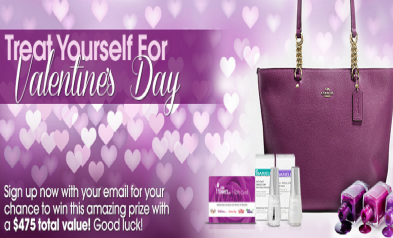 SWEEPSTAKES ENTRY PERIOD – All entries must be received on or before 11:59 p.m. EST on Monday, February 29, 2016. PRIZES – The Grand Prize winner will receive a red seven-quart KitchenAid Pro Line Stand Mixer. 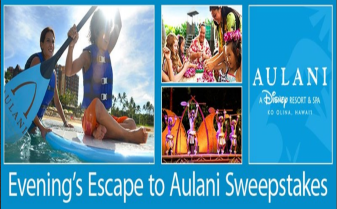 Evening’s Escape to Aulani Sweepstakes – Win a trip to Hawaii! Win a trip for 4 to Aulani, A Disney Resort & Spa in Hawaii! ENTER SWEEPSTAKES HERE – Evening Magazine Sweepstakes page. ENTRY LIMIT – Entries limited to one (1) per person for the duration of the Sweepstakes. ELIGIBILITY – “Evening’s Escape to Aulani Sweepstakes” is open to legal U.S. residents of the State of Washington, Oregon, Idaho and Montana who are 18 years or older. SWEEPSTAKES ENTRY PERIOD – The Sweepstakes will begin at 9 AM PT on January 25, 2016 and end at 11 PM PT February 7, 2016. PRIZES – Once (1) Grand Prize Winner will receive a prize package for up to four (4) people including: Up to four (4) round trip coach airfares between the Seattle International Airport and the Honolulu International airport (each as determined solely by Disney, with possible layovers). A voucher for up to four (4) round trip ground transfers between the Honolulu International airport and the Resort. Room accommodations consisting of one (1) standard room (with a maximum of four (4) persons per room) for four (4) nights at the Resort (as selected by Disney in its sole determination). $200 Resort spending credit valid at Aulani, A Disney Resort and Spa during travel dates. The estimated retail value of each Vacation Package is four thousand six-hundred and fifty dollar ($4,550.00). J. Crew Greatest Trip Ever Sweepstakes – Win a JetBlue Getaways trip & more! Win a $2,000 Getaways giveaway certificate, a $1,000 J. Crew gift card, a $1,000 pre-paid gift card & more! ENTER SWEEPSTAKES HERE – J. Crew Sweepstakes page. 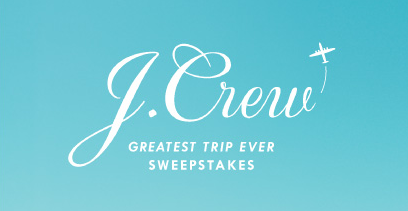 ELIGIBILITY – J.Crew Greatest Trip Ever Sweepstakes is open only to legal residents of the fifty (50) United States and the District of Columbia who are at least eighteen (18) years old at the time of entry. SWEEPSTAKES ENTRY PERIOD – The Sweepstakes begins on November 1, 2015, at 12:00 a.m. Eastern Time (“ET”) and ends on January 31, 2016, at 11:59 p.m. ET. PRIZES – ONE (1) GRAND PRIZE: A $2,000 Getaways giveaway certificate; two (2) air transportation certificates that each can be redeemed for one (1) round trip flight to winner’s choice of location (locations include: the continental United States, the Caribbean, Central America or South America; air travel is only applicable on JetBlue flights to and from JetBlue cities), details determined by Sponsors in their sole discretion; a $1,000 J.Crew gift card; and a $1,000 prepaid gift card. Winner and travel companion are solely responsible for obtaining valid passports and any other documents necessary for international travel. Approximate Retail Value (“ARV”): $5,196. ONE (1) FIRST PRIZE: A $500 J.Crew gift card. ARV: $500. ONE (1) SECOND PRIZE: A $500 J.Crew gift card. ARV: $500. ONE (1) THIRD PRIZE: A $500 J.Crew gift card. ARV: $500. ONE (1) FOURTH PRIZE: A $500 J.Crew gift card. ARV: $500. ONE (1) FIFTH PRIZE: A $500 J.Crew gift card. ARV: $500. “StarKist® Kid’s Creations™ Vacation” Sweepstakes – Win a trip to San Francisco! Win a trip to San Francisco! ENTER SWEEPSTAKES HERE – Starkist Facebook page. ENTRY LIMIT – Limit: One (1) entry per person. ELIGIBILITY – The Sweepstakes is open only to legal residents of the fifty (50) United States (including the District of Columbia) who are at least twenty-one (21) years old at the time of entry. SWEEPSTAKES ENTRY PERIOD – The “StarKist® Kid’s Creations™ Vacation” Sweepstakes begins on October 10, 2015, at 9:00a.m. Eastern Time (“ET”) and ends on December 31, 2015, at 11:59p.m. ET. 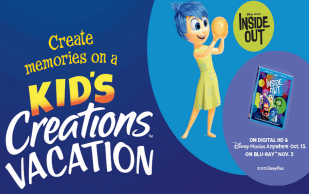 PRIZES – ONE (1) GRAND PRIZE: One (1) Grand Prize winner will receive (a) a trip for four (4) to San Francisco, CA; and (b) one (1) digital copy of the DVD for Inside Out. Trip package includes round trip, coach-class air transportation for four (4) from a major airport near winner’s home (determined by Sponsor in its sole discretion) to San Francisco, CA; four (4) nights’ accommodations at a hotel determined by Sponsor in its sole discretion (single room, double occupancy); and ground transportation to and from airport and hotel. Winner will be required to coordinate with Funjet Vacations, the Grand Prize supplier, for prize fulfillment and redemption. Winner must complete the trip on dates mutually agreed upon with Sponsor between February 1, 2016 and February 28, 2017, or prize will be forfeited. Approximate Retail Value (“ARV”) of Grand Prize is $4019.99. NINETEEN (19) FIRST PRIZES: Nineteen (19) First Prize winners will each receive one (1) digital copy of the DVD for Inside Out. ARV of each First Prize: $19.99.